In this post I would like to highlight a case that occurred this week. I feel the case brings out some important points in ultrasound utilization. A 52-year-old city parks and recreation employee presented with left foot pain of 2 months. He can recall no history of injury. 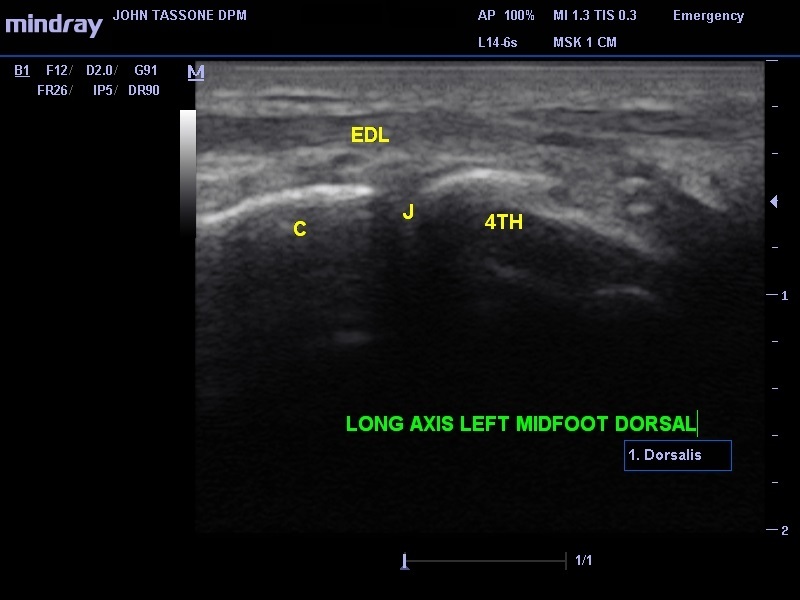 The pain is in the dorsolateral aspect of the left forefoot and over the 2 months, it has not improved. He describes the pain as sharp and stabbing, but has had no nerve-like symptoms (tingling, numbness, pins and needles). There is no swelling. What is interesting is that the pain is worst 30 minutes in the morning, and then subsides. He can have mild pain later in the day. Prolonged standing and ambulation does not make it worse. 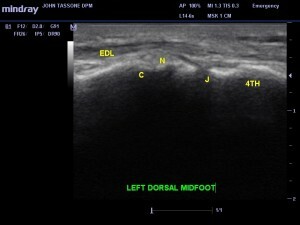 The exam was unremarkable except for mild pain at the base of the 4th metatarsal (met)/cuboid articulation. There is no swelling or warmth, redness, or soft tissue masses appreciated. X-rays did show some degenerative changes at the midfoot, especially near the lateral column. No spurring, soft tissue swelling, or fractures were appreciated. Biomechanical X-rays assessment was unremarkable. 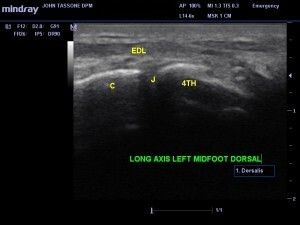 Diagnostic ultrasound revealed on long axis (image 1). The painful area correlated perfectly to the cuboid/4th met articulation. There was no effusion. 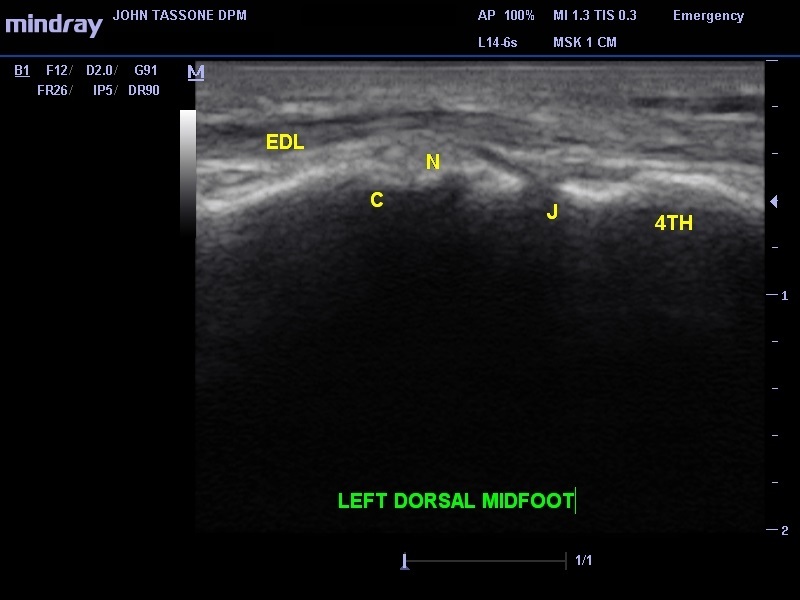 The EDL tendon was acoustically normal. There were no soft tissue masses at the area of pain. In the second image (image 2), also the long axis, another structure is present. The classic honeycomb oval appearance of a nerve is seen in the area of pain. Even though we are imaging in the long axis, the nerve running obliquely is being imaged in the short axis. The nerve appears normal, but of course that does not mean it is not the source of pain. Thus, it can be joint pain (4th/met) or a nerve etiology. Both are in the area. Image 1. C, cuboid; 4th met., the base of the metatarsal; J, the joint; EDL, extensor digitorum longus). Now, one can argue I already realize that by knowing my anatomy and palpating, so I do not need an ultrasound. The point is now you have a visual. You now know there is 1) no soft tissue mass, 2) no effusion, 3) normal EDL, and 4) the nerve is normal in appearance, ruling out peripheral nerve tumors. I have heard it asked in workshops, “what if the ultrasound shows nothing?” My response is to equate that with radiographs. Unremarkable X-rays tell us a lot; the same is true for ultrasound. In this case, it ruled out a great deal, confirmed what we are palpating, and helped us form our differential diagnosis. This would be site specific, so we bill 76882.